Behavioral healthcare organizations have very specific needs for their furniture. Safety is a huge concern for psychiatric facilities and other related areas as behavioral health patients are at a greater risk of self-harm and other dangerous acts. However, cold, uninviting institutional-like furnishings can have a negative effect on patients, which is why healthcare practitioners should look for residential-style contract furniture can make a facility a much more comfortable environment. Here are five quality furniture styles that can be the right fit behavioral healthcare facilities. 1. Solid Wood Crate Style Furniture: Crate style wood frame furniture offers practitioners both durability and aesthetic appeal. TOUGH STUFF crate furniture can withstand years of heavy use thanks to its solid wood construction. Crate furniture can be made in a variety of finishes to match the look you want and come with attractive cushions that can be easily replaced. 2. Upholstered Behavioral Health Chairs and Recliners: Durability is an important aspect for behavioral health practitioners, but many facilities also require furniture that can be easily cleaned. Upholstered motion seating is a comfortable and cleanable furniture option for behavioral health facilities. If patients have issues with incontinence or other spills, different anti-microbial, anti-fungal, water-resistant, and stain repellant fabric treatments can make clean-up an easier process. 3. Anti-Contraband Furniture: Unfortunately, some behavioral health and psychiatric facilities need to keep watch for contraband items while still allowing some privacy for their patients.Anti-contraband bedroom furniture features open shelving so that staff can quickly and easily inspect bedrooms for banned items or substances. This also takes away breakable parts like draws that patients could use to harm themselves or others. 4. Molded Plastic Furniture: Molded plastic contract furniture is a prime choice for behavioral health practitioners concerned about safety. Molded plastic furnishings are available with bolt-down options to keep them from being taken or thrown. Other plastic furniture pieces can be weighted down with sand for added security. Molded plastic is also designed for heavy use and can be easily wiped down in case of spills or other accidents. 5. Outdoor Furniture:Outdoor areas can be a therapeutic environment for some behavioral health patients. Outdoor contract furniture like durable steel benches and tables give you quality furnishings for outdoor use that can hold up through the elements. 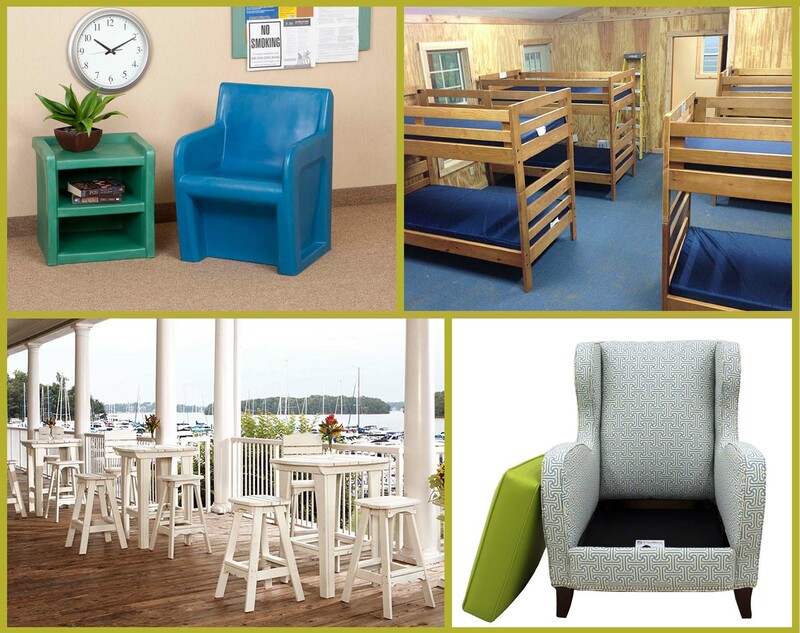 Every behavioral health and psychiatric environment has specific needs for its furniture. Once you’ve determined which furniture you need, creature a custom Wish List to get a no-obligation price quote from our team. If you have any questions, make sure to give us a call at 800-969-4100 today.